Friday is here at last! Are you excited for the weekend? I can't wait for Saturday...I'm having lunch at my favorite French restaurant with two close friends I haven't seen in months. Yippee!! Bring on the real french onion soup and flaky pastries! 1. Did you pass your driver's test on the first try? Yep. The instructor actually said, "I shouldn't be passing you because you really need more driving practice, but I'm going to do it anyway." Har! He was right, though. I had a fender bender in my high school parking lot a few weeks later. I guess I figure that whatever I do, somebody else has been there before or had it worse, so it's really not a big deal. And if you do something stupid in front of strangers, you probably never see them again. Hopefully! 3. What TV show would you like to be on- Oprah, Biggest Loser, or What Not to Wear? It would be an amazing time. I guess would consider a tummy tuck after I'm done having children. I've bounced back fine so far, but you never know what could happen after #3, or even #4!! 5. What are your favorite jeans to wear? I have two pairs of jeans from Old Navy that fit me perfectly. I'm not one of those "jeans as an investment" types. I don't think I've spent over $30 on a pair since college! I much prefer skirts anyway. So comfy. 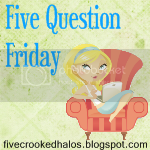 Want to read more about 5 Question Friday? Go to My Little Life, and enjoy! Hope your weekend is terrific! At least you can't come up with something for embarassing moment, I would probably have a list. LOL! I have plenty of embarassing moments! I love your blog, its too cute!! I'm pretty at good embararassing myself on the regular. Man! I change my answer to Oprah if I get to be on her Favorite Things episode! ;) And I LOLed at the Dane Cook reference! My favorite jeans are from the Gap and I bought them last year. I have 2 pair. LOve your blog! I have a love of anything vintage or handmade too. I wish I had a little baby to put those leggings on!! Do you make hats big enough for 3 year olds? My first time stopping by...by way of FQF. I had a similar experience with my driving exam...but got it the first time too. Kim: I do make hats in larger sizes, toddlers AND adults too. Email me, if you'd like. I'm completely with you on the Old Navy jeans. My fave!